Aaron Watty, the man behind Big Tar Wines, can seem to contain multitudes. A bear of a man at well over six feet, he’s a waiter at bouchon, was a wine buyer at Wine Cask, served as assistant winemaker for Longoria Wines, and even once worked as a model. But all that doesn’t negate his dramatically failed first attempt to pass a UCSB communications course. “The class in Campbell Hall was basically as big as my hometown,” said the Incline Village native. “So I had to do a speech — it was something easy like arguing for electric cars — but I was so nervous that I passed out and bounced my chin off the podium.” He came to, ran to the men’s room, and never returned. The next quarter, hoping to expunge the grade, he convinced some friends to take the class with him. “Day one, the professor says there’s a speech everyone has to do, and it isn’t a huge deal, but last quarter someone passed out, and we haven’t seen him since, so we hope he’s okay,” explained Watty. “At that, my friends sitting with me pointed at me and said, ‘He’s right here!’” That quarter, he handled the speech fine and earned an A. These days, it’s hard to believe public speaking was ever an issue — especially after following Watty around at a recent Saturday farmer’s market. 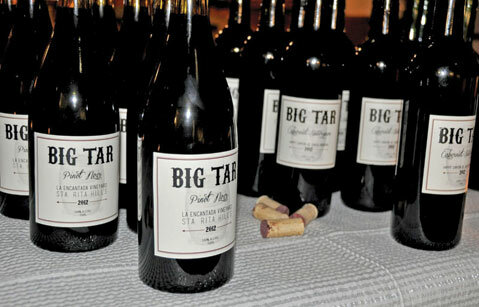 There, he greeted everyone with a smile while purchasing produce for the December 7 winemaker dinner that he prepared himself to showcase the latest Big Tar wines. He did get some help from his mom, Kathleen Watty, the recently retired longtime public school principal, which makes sense because Aaron is all about family. That also showed in the dinner’s leg of lamb, which was succulently grilled and presented upon lentils and roasted purple carrots from Roots Farm. Lamb was the favorite dish of his Gram Gram, Watty’s biggest supporter. “While I’m the one who didn’t quite make it through UCSB in a family of educators,” explained Watty, a bit choked up, “she said, ‘Follow your dream.’” Now Big Tar features a Cuvée Jean Murphy in her honor, and the sprightly Super Tuscan blend of sangiovese and cabernet sauvignon from Happy Canyon danced to life with the lamb like Fred and Ginger doing the Continental in The Gay Divorcee. It’s sad he won’t be doing more work with pinot noir, for his one-off project with 2012 grapes from La Encantada Vineyard in the Sta. Rita Hills was such a lovely yet balanced study of cherry and spice. Served with a Gramercy Tavern‒inspired arctic char — which he special-ordered from the S.B. Fish Market — that was crusted and topped with mushrooms and a vivid layer of spinach, the dish sang in harmony with the pinot. 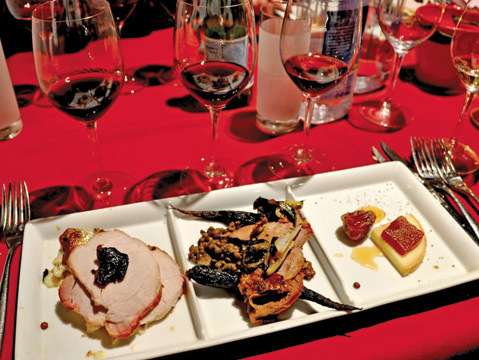 The evening was a strong argument as to why more winemakers need to take to the kitchen for their own wine dinners, for they are often the most adept at making their wines shine with the right foods.